What is it with robot supervillains? They never seem to have the same look twice. Just look at Brainiac, who has been everything from a green-skinned humanoid to something more akin to a Terminator endoskeleton. Ultron's never looked the same twice (other than the head, which has always been the same), and even the Eradicator has had a few different designs. Of course, Superman's perennial foe Metallo is no exception. Professor Emmett Vale rescued John Corben after a car crash. Vale was an astronomer who had years before noticed Superman's star drive blaze through the skies. After years of searching, Vale had found the rocket's remains and taken the fragment of kryptonite lodged in it. He also decoded part of a message Jor-El left in the rocket and mistakenly believed Jor-El had hostile intentions. Vale repaired Corben, providing a robotic body powered primarily by the piece of kryptonite. After Vale told his story, Corben killed him and began a criminal career as Metallo. Metallo's most recent, and probably most iconic, depiction has been a sort of half-human, half-robot cyborg form as seen in the DC Direct Superman/Batman figure. However, the Horsemen decided to skip this Terminator-lite look and go straight for the "giant killer robot" design. 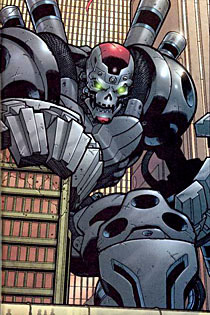 It's based on Metallo's appearance in Superman #154, when Metallo was "upgraded" by Brainiac 13. The figure isn't quite to scale, since Metallo was about as tall as Godzilla in that issue, but it does justify Metallo being a BAF. It's a good design and, while I hope we get a smaller, more humanoid Metallo down the road, this was one of the more unique depictions the Horsemen could have chosen. 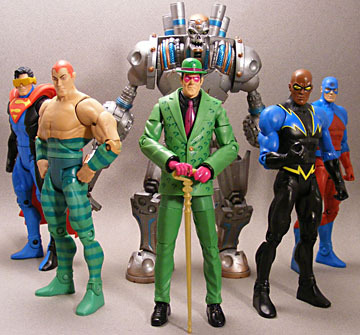 To build Metallo, you're going to have to lie, cheat and steal to get all five figures in the Wal*Mart-exclusive fifth series of DC Universe Classics. But once you've got him put together, you'll have one of the best "Collect-and-Connect" figures yet. Metallo stands between 8"-9" tall, depending on how straight you can get him to stand. I say that because his articulation is very loose - but we'll get to that in a moment. From a sculpting standpoint, Metallo is the same sort of exceptional work we've long since come to expect from the Four Horsemen. He has one of the most detailed sculpts yet in a DCUC figure, with lots of mechanical detail. I particularly like the dents and scrapes all over his body, making it clear he's been through a few rounds with the Man of Steel recently. While the paint applications on this series have been hit-and-miss, fortunately Metallo seems to have gotten extra attention. 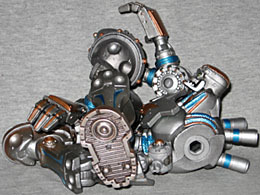 Mattel chose a nice silver for the body, which looks metallic and fades into a brown-yellow rust at some parts. It gives him a futuristic look while, along with all the dents and scrapes, grounding him in some reality. I can actually imagine seeing this thing lurching toward me down the street. The silver is highlighted at points by orange-brown and greenish-blue. They're the right colors for the character, and help distinguish him from silar robotic villains like Brainiac. 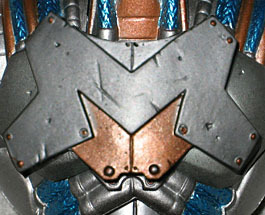 But what's really impressive is the paint work behind the removable chest plate. This reveals Metallo's energy source - a giant hunk of Kryptonite. The spray around the socket manages to convey a great glow effect, rather than looking like someone used Metallo for paintball practice. Whew! Ordinarily, I'd be more than happy to gush about all this articulation, but there are a few problems. First, the torso balljoint on my Metallo is very loose, which is bad, since the figure is very top-heavy, meaning he'll tip over at the slightest movement. It takes some careful balancing to get him to stand properly in any given pose. 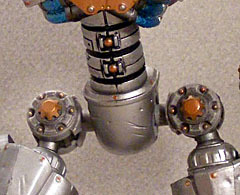 Even more annoying are the swivel joints on the pelvis. Metallo was apparently supposed to work like Metamorpho: you plug the hexagonal leg pegs into the swiveling sockets on the pelvis, and it's the sockets, not the pegs, that move. Unfortunately, the sockets in mine (which are a separate piece from the rest of the figure) are also very loose - so loose Metallo simply couldn't stand up. I finally decided to just superglue the sockets in place and move the legs by popping them out of the socket and then replacing them in a different position. Fortunately, the hexagonal nature of the pegs lets them hold any position well. The looseness of the articulation is my only problem with this figure. I love his sculpt and size, the paint work is well executed, and I like the amount of articulation; it just needs to be executed with better quality control. 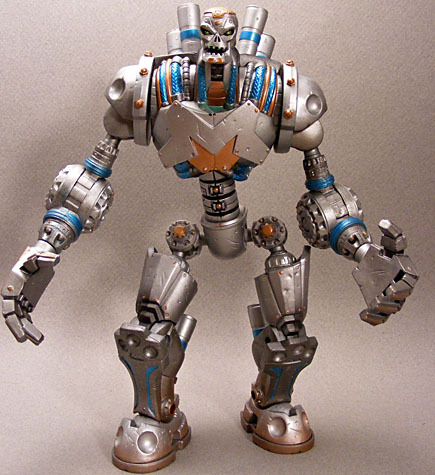 Still, Metallo is one of my favorite Mattel build-a-figures so far, just behind Grodd and Solomon Grundy.